Why Switch to Altaro now? Stop overpaying for bloated enterprise backup solutions you do not need. Opt for an agile Hyper-V & VMware backup solution instead, built for businesses of 1,000 employees and under. Altaro VM Backup is affordable, straightforward and easy to use. Veeam is one of the most expensive backup products on the market, whereas Altaro VM Backup is an affordable, full-featured, fuss-free alternative. Both Veeam’s initial and renewal costs are significantly higher, with a complex multi-tiered pricing structure. Added to this you face extra indirect costs with Veeam. It requires a separate installation of Windows, and a license for Microsoft SQL Server - this adds hardware and Microsoft licensing expenses on top of Veeam’s bill. Veeam is primarily targeted at enterprise environments and includes several features that 99% of companies don’t need. Veeam’s bloatware translates into a product that is very difficult to use – as well as far pricier. It also takes you longer to get up and running and you need more time and resources to manage and maintain your solution. Veeam’s difficult-to-use solution can be an added frustration, just what you DO NOT need in an emergency recovery operation. Altaro is so straightforward you do not need to be certified to manage your backups. Installation is also fast; you can be up and running in less than 5 minutes! Bloated enterprise solutions like Veeam’s are overly complicated, dramatically extending the time your need to get started. 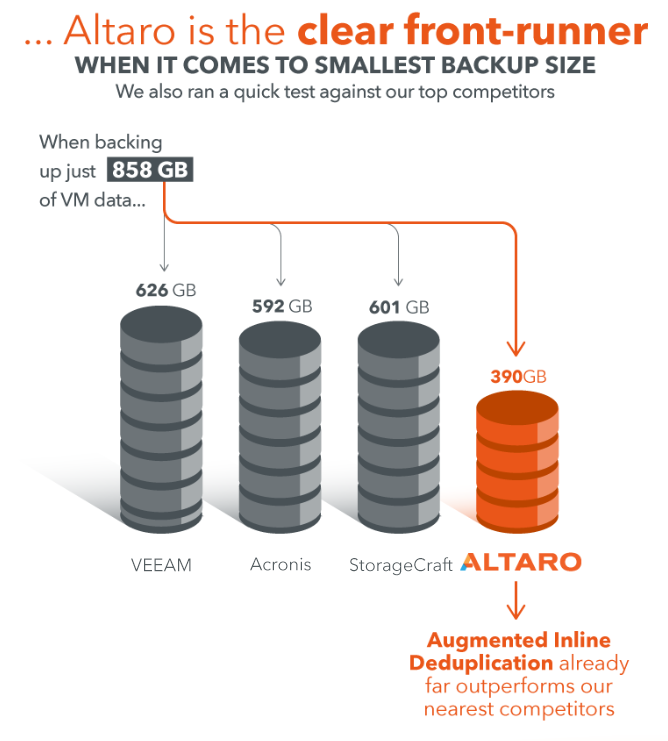 Altaro’s Augmented Inline Deduplication is much more efficient when compressing and deduping protected workloads, saving you more time and money on storage space. In identical tests, Altaro VM Backup compressed and deduped 858GBs of VM data down to 390GB, while Veeam could only reduce it to 626GBs. Veeam necessitates appliances running in Azure to facilitate offsite backups. On the other hand, Altaro VM Backup connects directly to an Azure Based Storage account for maximum efficiency and cost savings. We’ve switched from Veeam to Altaro, and we are already starting to see and experience the benefits of Altaro over our former Veeam partnership. I can safely say that Altaro will be the go-to solution for DR/BaaS for us and other partners like ourselves. No SQL instance required, minimizing any third-party issues. Priced per host, not per socket. Expensive. $950 minimum per host (assumes Backup Essentials which maxes out at 6 CPU sockets). Requires a dedicated server and SQL instance, both of which need to be installed, managed and licensed, adding to the complexity. Time to install Less than 5 minutes. If .Net Framework is already installed. Varies, 30 minutes minimum. Additional time required if a clean Windows environment is not prepared. Additional time is required if an additional SQL instance needs to be set up. Ease of use Very simple to use. A novice user should be able to perform both backups and restores without much effort. Extremely difficult to use. Settings are not well-explained. Error messages are not clear. There’s a certification path for Veeam’s products because of their complexities. Can back up directly to an Azure Blob Storage Account? Yes. Altaro connects directly to an Azure Based Storage account, for maximum efficiency and cost savings. No. Veeam requires an appliance running in Azure in order to facilitate offsite backups into Azure, increasing cost and complexity. Fit for SMBs (1-50 hosts) Perfect fit. Altaro provides a product with a feature set and pricing model that fits well with SMB needs and budgets. Too complicated and expensive. Veeam’s bloatware translates into a product which is difficult to use. Built for enterprises, you end up paying for features you will never use and complexities you can do without.